Continue on to read the entire patch notes courtesy EA SPORTS. To ensure Madden is the best game possible, scheduled updates are deployed by the Madden Development Team to add features after launch and to tune gameplay based on community feedback. Thank you for your feedback – you've helped us improve Madden NFL 19! We look forward to further feedback and are committed to continued improvement. 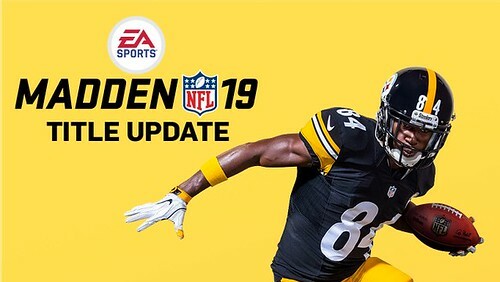 Here is a detailed breakdown of the newest update that is now live in Madden NFL 19. *Dev Note: In an effort to create more opportunities to make plays on the ball in Player Lock and Franchise Player, we've replaced the Player Lock cameras with our MUT Squads position-specific cameras. These cameras balance your player and the ball in frame as much as possible. This will enable you to make better reads on the play as it develops, as well as move on the ball in passing situations. In addition, we've implemented a punt and kick return view for Franchise Player when you are put in that position for your team, playing as a Running Back, Wide Receiver, or Defensive Secondary role. +DEV NOTE: Because Rushing Yards Per Carry is currently below our target range on All-Madden, we have slightly decreased the frequency of early block sheds on All-Madden by tuning them a little bit more towards the values used on All-Pro, where Rushing Yards Per Carry is within our target range. The latest title update for Madden NFL 19 includes some tweaks to the Hit Stick feature that Madden gamers will notice. The player ratings used to determine Hit Stick results have been changed. The formula now uses only the defender’s Hit Power rating (POW) vs. the ball carrier’s Break Tackle rating (BTK) to determine the outcome of the Hit Stick, while Strength (STR) has been removed from the formula.